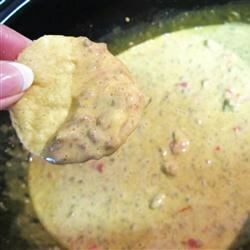 "This recipe is VERY easy and VERY good!! It doesn't last long so you may want to double it if you are fixing it for a crowd. Serve with tortilla chips." In a large skillet, brown ground beef. Drain fat. Stir in seasoning packet and water. Bring to a boil, reduce heat to simmer. Let cook for 5 minutes, stir occasionally. Place ground beef mixture into a slow cooker. Add tomatoes and cheese to the slow cooker. I added a can of refried beans and a jar of Salsa, any style. My family cant get enough. A friend gave this recipe to me a few years ago, only we use salsa, and call it "dog food". My husband's friends all beg me to make it for parties, and fight over it. Really good. I didn't let enough of the 'juice' simmer off when cooking the beef so the dip was a little soupy, but it still tasted amazing. Was a big hit and sooooo easy to put together. used jar of taco sauce instead of crushed tomatoes.